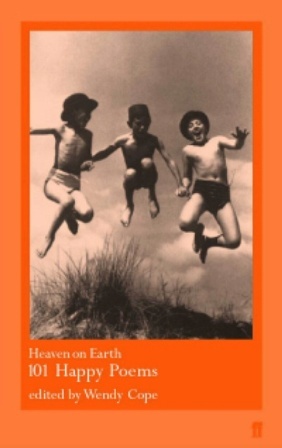 The editor of this anthology, Wendy Cope, says that she compiled Heaven on Earth: 101 Happy Poems as an argument of sorts against widely held ideas that joy ‘won’t be put down on paper’ and that ‘Happiness is the one emotion a poem can’t capture’. Certainly, as a writer, I have found that my most successful poems have arisen from experiences that upset me. Maybe because writing a good poem feels like a small way to put something right. Perhaps this is also why customers are more likely to take the time to draft a complaint when they are dissatisfied, rather than compliment when they are satisfied. Who knows what strange aspect of human psychology has caused us to be so ungrateful, but apparently “happy” poems are a rarity. And if that is true, it’s a terrible shame, because the ones in this book are fabulous. There is a mix of both modern and traditional poems in this anthology, suggesting that the human capacity for joy is timeless, and that the things that make us happy remain essentially the same. I would have preferred to see fewer religious poems included, but I was glad to find many poems that were translations, giving the book a global feel. It’s charming to read a variety of voices from different cultures, times and situations expressing such positivity and joy for the act of living. In fact, such happiness is rather contagious. So, allow me to share with you a few of my favourite moments from the book, in hopes of passing on a smile or two. that uninspired stone body, floodlit. It makes me laugh. In fact, it makes me sing. To hear what it is you’re saying, to master the code. Who is just like me. Heaven on Earth: 101 Happy Poems is published by Faber and Faber. Bronwyn Lovell is a poet living in Melbourne. Her poetry has been published in Antipodes, Cordite Poetry Review and theGlobal Poetry Anthology. She was shortlisted for the 2011 Montreal International Poetry Prize. This entry was posted in Arts, Books and tagged arts, books, lip verse. Bookmark the permalink.